News, School Policies, What's New? NH lawmakers recently tasked themselves with working out the details of a controversial school choice bill. In theory, School choice could allow public education funds to follow students to the school that best fit their needs—whether that’s to a public school, private school, charter school, home school or any other learning environment parents choose for their kids. This educational idea is not a new one, but has come to the forefront yet again. 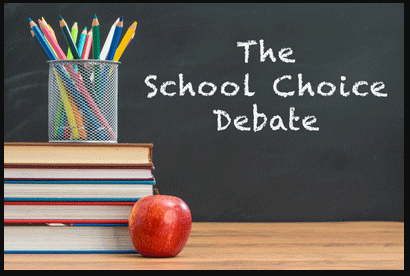 Two Newfound teachers were interviewed about their opinions and thoughts about school choice and if it should be implemented in New Hampshire. John Lellos and Chris Ulrich gave their point of views. One argument against school choice has to do with the variable of location. John Lellos said, “ It’s far more savoury for urban environment than it is for rural environments like New Hampshire; it is not an ideal type situation for us as a state.” For bigger cities like Boston or New York, it would be much more ideal. There are questions as to if a school should be treated like a business sort of like school choice is. Mr.Ulrich said, “As a business, if something comes in and it’s defective, you would just throw it away. In a school, though, you can’t take that kid who was abused or neglected or has disabilities and just chuck them away. We can’t turn any kids away, so that means we can’t treat school like it’s a business because once we do that, public schooling is no longer public schooling.” Mr.Lellos also mentioned, “The last time I checked, students aren’t cars, students aren’t sandwiches, and students are not something we can purchase, and they are not consumer goods. In order to compete in a competitive market you have to advertise and you have to play the game of businesses. Do we want to apply these theories to teaching? Of course not. I think there is a moral trap we would fall into.”When hearing both sides of the opinions, it is evident that neither are for school choice. They believe that it is not just and fair. There are more downfalls to this then there benefits. So in conclusion, both Mr. Lellos and Mr. Ulrich feel strongly that bill SB193 not get signed.